When picking 8th notes pick down on the beat (1 2 3 4) and up on the "&". 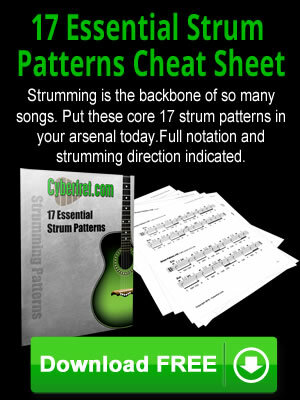 The easiest way to get a grasp on rhythms is to start to recognize pattern that reoccur. Below are 2 different 2 beat rhythmic patterns that use dotted quarter notes. If you can start to see these patterns instead of just a mess of different rhythms, then you are on your way. The following exercise uses these 2 patterns. In the top line, half the measure is one of the 2 patterns, and half is either a half note or 2 quarter notes. In the bottom line the are only the 2 patterns. It can look like a big mess until you are able to see the patterns.